Despite the dark element in this good versus evil fable, an uplifting message still shines. A stranger’s cruel actions towards a kind Owl Man are sure to alarm the young reader. The stranger’s desire to possess the Owl Man’s ability is scary, however does ask the reader to think about what may provoke such negative behaviour in any human. Although I wish for good to prevail for all characters, it is difficult not to rejoice in the victory the owls have in attacking the stranger, recognising him as foe, despite his attempt to disguise himself in the Owl Man’s white cloak and willow wand. We are equally satisfied when the Owls’ recognise the young boy who emulates the Owl Man, as a friend. This story left me feeling fulfilled with its notion of connectedness between the animal and human world, and the natural acts of kindness and love exchanged to protect each other, even though the story alludes to the supernatural. 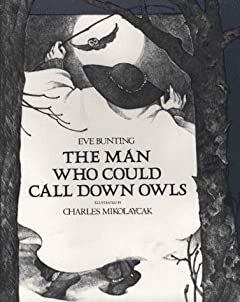 Bunting cleverly shows us that the ‘magic’ is simply this unique bond; that which allows the Owl man to heal the Owls, and that which draws the Owls to him. The dramatic tone of the story is enriched by Mikolaycak’s powerful black and white pencil illustrations, highlighted with a blue border; marking a mood which can only be felt by the reader. An interesting exploration with children may be to look at black and white art in other picture books. How does the use of colour affect the mood of the story and the reader? What different media is used? Sylvester and the Magic Pebble is perfect in it’s literature, illustrations and messages. It is obvious why this delightful picture book won the Caldecott medal in 1970. Sylvester Duncan, pebble collector, finds one which allows all his wishes to come true! Ironically the ony wish he truly desires, seems impossible. Upon a frightful meeting with a lion, Sylvester wishes himself into a rock and thus, the magic pebble is left outside himself. How will he ever be his donkey self again, and reunite with his family? The remainder of the story is the aftermath of this encounter. As Sylvester’s fate unravels, we witness the misfortunes of fortune….and vice versa. The reader experiences sadness at his parents loss, and poor Sylvester’s internal roller coaster of fear, frustration, grief and loneliness. The pertinence of his being inside a rock captures this intensity, highlighting his feelings of being helpless, unheard and alone. Similarly, this may touch the young reader who may be accustomed to such feelings when communication and language are misunderstood. Steig has not only captured a depth of emotion with this tender story, but also a colourful wit with his characters and illustrations (despite its controversy and ban for the anthropomorphic pigs dressed in police attire). A wise message for any age reader: appreciate everything that you have, and be careful what you wish for. “…but really, for now what more could they wish for? They all had all that they wanted”. The Long Blue Blazer is narrated by an unnamed young girl who reminisces about her brief encounter with the mysterious boy Wilson. I loved the girl’s detached narrative – she makes no assumptions and doesn’t tell the reader what to think. It prompts us to look to the illustrations for clues. Why doesn’t Wilson want to take off his blazer? The obvious answer is that it makes him feel safe – he needs the emotional security. But this is contradicted by the fact that he is a strong and confident character who has the emotional independence to make his own decisions and challenge authority. This is a thought-provoking book that prompts both an emotional and a creative response from young readers. Does Wilson really have a home? Where does he come from? How did the teacher know that he was coming? How would it feel to have nowhere to sleep? Do we all have our own secrets? Is Wilson an alien, or just alienated? Regardless of the interpretation, this magical realist gem leaves room for young readers to wonder.